Access to lolo collaboration via SMB access was removed (9/15/2017). The standard ssh-protocol access to lolo collaboration should be used to access data stored on lolo collaboration. For low-cost SMB storage, please consider the Standard Windows File Service (WFS). The lolo Collaboration File System has been designed to support the sharing of data among researchers on the UW campus, users of Hyak, and peers at other institutions. It can act as a high performance data transfer node (throughput of hundreds of MBs to Gigabytes per second, depending on file size, number of files, etc. ), as well as a convenient means of accessing Hyak results from workstations in your lab. The following diagram illustrates the data center environment in which the lolo file systems reside. The lolo Collaboration File System is an excellent option for research groups requiring a means for fast, convenient data sharing with peers on and off campus. 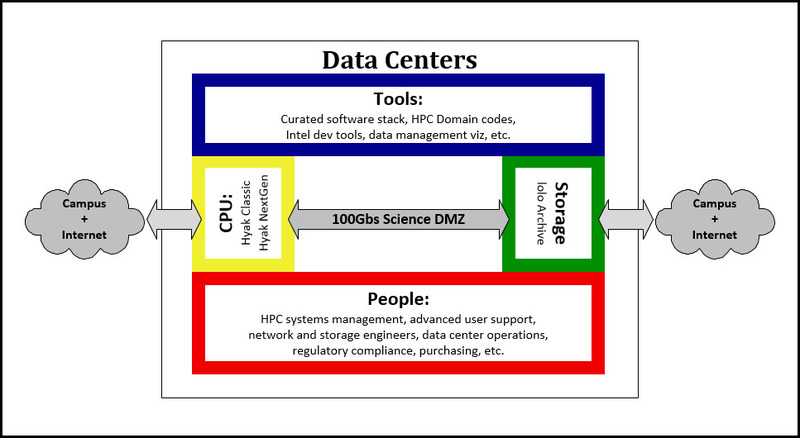 The lolo Collaboration File System is part of an integrated, scalable scientific computing infrastructure operated by UW-IT, including Hyak, the lolo Archive, and a high performance research network, supporting fast data transfer among these systems and between them and campus and the Internet. Storage may be purchased in 1 TB increments, up to 1 PB or more. UW-IT Managed Servers can be configured to access lolo via NFS or GPFS. Hyak will be offline from 9:00 a.m. - 5:00 p.m. for scheduled maintenance the second Tuesday of every month. Every third month, the maintenance window will last from 9:00 a.m. to 9:00 a.m. the following morning. Storage may be purchased in 1TB increments. Billing is monthly and based on the storage allocated, not the capacity consumed. Mid-year rate reductions are possible when consumers purchase 20TB or more. Rates are the same for all customers. Lolo was developed by the eScience Institute and is provided by UW-IT. lolo is a word in Chinook Jargon, meaning "the whole thing" and "to carry", depending on the application of accents. Written in lower case, lolo also represents a binary string (decimal 10). Chinook Jargon is the trade language of the Pacific Northwest, incorporating terms from Chinook and Chehalis and other local languages, as well as French and English. We've chosen words from Chinook Jargon for the names of systems in the UW research cyber infrastructure to emphasize their role in supporting the broad range of UW research users and our ties to our place between the mountains and Salish Sea.